The emblem represents a composition as a rectangular made in a double multi-coloured framework. The rectangular is divided on a vertical into two equal parts of dark blue and white color. In the center of a rectangular the circle allocated by contrast colors in relation to a background is placed. This central figure is a symbol of eternity and perfection, speaks about infinite process of evolution of humanity which improves the world, not destroying it. In the middle of a circle the image of the lion laying on a pedestal is placed. The lion is a symbol of the sun as source of vital energy, a symbol of wisdom, reason and authority, a symbol of stability, riches and fidelity to traditions. In the left part of a composition white letters on a dark blue background execute an inscription "CONSERVATISM is based on unwritten laws of a life. They were, are and will be in eternal". In the right part of a composition dark blue letters on a white background execute words "FORMATION", "HEALTH", "LOVE". Crowns a composition an inscription "CONSERVATIVE PARTY of RUSSIA", executed with letters of black color on a grey background. The combination in a composition of white and dark blue colors symbolizes freedom and commonwealth. 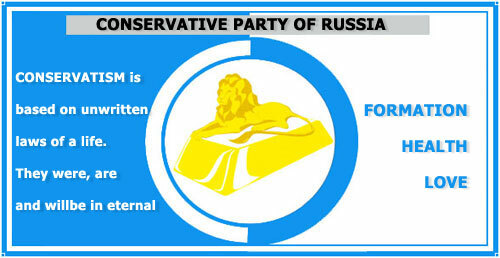 All composition as a whole symbolizes main principles of Conservative party of Russia. It is stately, rich, fine. For light of heavens your clear. Let in friendship and the world lives. We came by the twenty first century. The Earth to keep to the person. And happiness to all people will give. In fact pride of the ground the person. Be in the consent, happiness and friendship. At Fatherland will be on service. To you - prosperity and honour!